Penguin Random House India are delighted to release the new title Bollywood Boom by National Award winner Roopa Swaminathan. Her last book Star Dust: Vignettes from the Fringes of the Film Industry won the coveted Swarna Kamal for Best Writing on Cinema. Bollywood is bold, beautiful and happening. And it’s happening now. From Raj Kapoor to Amitabh Bachchan to Aamir Khan and Shah Rukh Khan, Bollywood has been India’s best cultural ambassador, be it in Russia, Africa or East Europe, and now in the UK and the US. 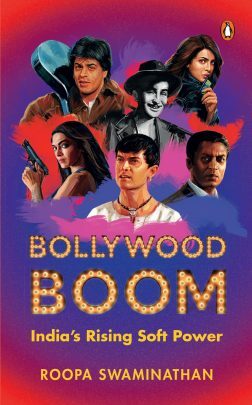 In Bollywood Boom, National Award–winner Roopa Swaminathan explores the spectacular success of Bollywood in the twenty-first century and its rapidly rising power to influence the world. She argues that besides international goodwill, Indian cinema brings to the country real income through trade and tourism, and also enhances its global standing. Extensively researched and peppered with fun anecdotes, this remarkable book shows how Bollywood has the power to mold India’s fortunes by winning the hearts of people across continents. The world is feeling the impact of Bollywood like never before. From the Oscar-nominated Lagaan to Bajrangi Bhaijaan to Ae Dil Hai Mushkil, Bollywood has come a long way since the watershed Dilwale Dulhaniya Le Jayenge and the UK Top Ten debut of Kuch Kuch Hota Hai. Where earlier it was in Russia, East Europe, and Africa that Raj Kapoor and Amitabh Bachchan enjoyed a devoted fan base, today the entire world is as entertained by the three Khans as by the international stars Irrfan, Priyanka and Deepika. In Bollywood Boom, National Award–winner Roopa Swaminathan opens a window to the spectacular success of Bollywood in the twenty-first century and its direct contribution to India’s rising soft power and influence. Using extensive research, a compelling argument and fun anecdotes, Roopa shows how Bollywood not only brings to the country real income through trade and tourism but also enhances its global standing. Roopa Swaminathan is a National Award–winning writer, filmmaker, and scholar. Her book Star Dust: Vignettes from the Fringes of the Film Industry won the coveted Swarna Kamal for Best Writing on Cinema in 2005. She has also written, executive-produced and directed a feature film for NFDC, Five by Four. Roopa has a doctorate in international relations from Norfolk, Virginia, USA. Presently, Roopa commutes between writing in Pune and teaching wherever there are passionate young minds is working on her upcoming books and trying to sell her screenplays.